This rarely seen interaction between two of Europe's top predators was caught on camera in the Carpathian Mountains of Poland by forest ranger and biologist Zenon Wojtas, who's been tracking wolves in this region for many years, after becoming fascinated with the elusive animals when he was just a teenager. Wojtas works at the Magura National Park in Beskid Niski, a region of the Carpathians known as the "Wolf Mountains". Here, one of the continent's largest populations of bison roams side by side with other wildlife rarely seen in Europe, including brown bears, boar, beavers, lynx and the area's star canid predators, wolves. His focus is on the monitoring and protection of these often vilified carnivores. Having spent countless days (and nights) in the dense Carpathian forests, even during the cold winter months, Wojtas has notched up many amazing wildlife encounters, but this is one he describes as the "experience of a lifetime". "I don't think many people can say they've seen how a wild lynx behaves in the presence of a wolf – not to mention three lynxes, as this was a female with two kittens," he says. The young cats, seen in the video at a safe distance from the unfolding action, watched their mother's behaviour intently. On the wolf's part, Wojtas explains, the interaction looked quite playful, with lots of yelping and barking. But the lynx, likely in protective mode with her young close by, didn't appear to be in a light-hearted mood. "As the wolf slowly walked towards the female lynx, she arched her back to protect her kittens, as all mothers would do. It was not a fight, the wolf only wanted to play," he says. In the end, he recalls, the lynx chased off the wolf, who retreated with its tail between its legs. Europe is home to around 12,000 wolves and 9,000 Eurasian lynx. Image: SirtakySid, Flickr (left); Harald, Flickr (right). 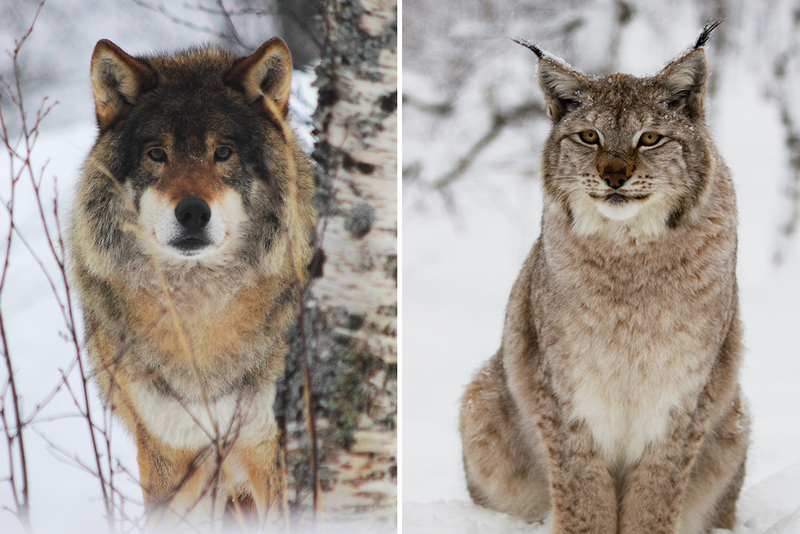 Research from 2014 has shown that many European countries now have a "permanent and reproducing population of at least one of the four large carnivores" – lynx, wolf, bear and wolverine. But this return to their historical hunting grounds has not come without some controversy. In Poland, a population of around a thousand wolves survives today, and they require large territories, and a good supply of deer and boar, so protecting the forests where these animals roam is key. The wolves' presence, however, is not always welcomed, due largely to their occasional taste for livestock. They also tend to inspire fear – despite the fact that not a single confirmed attack on humans has been reported since the mid-1940s. As for the Eurasian lynx, they've clawed their way back from an even more precarious state – in the 1950s, just 700 or so survived in Europe. And while plans for their return to Britain are gaining momentum, and their impressive recovery in some countries has been celebrated, the cats' survival in Europe is by no means secure. Poland is home to as few as 200, found only in the most remote stretches of wilderness. Shrinking forest cover and a lack of prey prevent their numbers from growing, and female lynx have a hard time feeding their young. All of this makes sightings like this one particularly special, which is something Wojtas is keenly aware of. "Observing wild lynx and wolves in their natural habitat is extremely difficult and rare ... This encounter is unique as it gives us an insight into the harmony that exists in nature, where predators can live in the same habitat without harming each other."